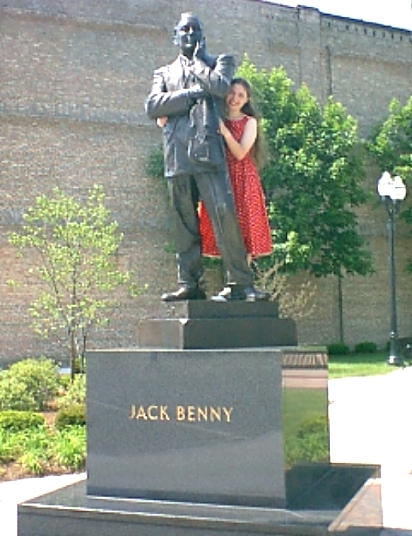 Photos from the dedication of the Jack Benny statue in downtown, Waukegan, IL, Saturday, June 8, 2002. 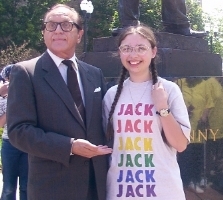 My daughter Karen (the back of her T-shirt says "BENNY BENNY BENNY" etc) with Jack Benny impersonator Eddie Carroll, who starred in the Jack Benny Program recreation that was performed at the unveiling ceremony. Karen on the statue. Her school encourages students to supply their own senior pictures showing something the student is interested in, rather than a formal studio pose. Karen graduated from high school in May 2003, and this was her official senior picture! Jack's statue from the rear. 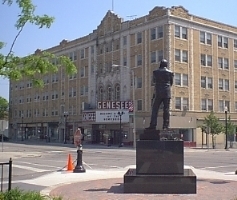 The Genesee theater hosted the world premiere of the Jack Benny film MAN ABOUT TOWN in 1939, with Jack and Mary performing onstage. 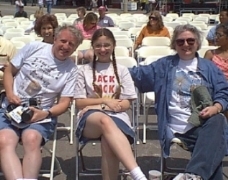 Us (Dan, Karen, Kathy) waiting for the show to start.